As one of the world's leading suppliers of gene synthesis services, GenScript has a proven record of dedication to innovation in our constant efforts to integrate new and updated technology into our gene expression repertoire. GenScript's OptimumGene™ Gene Design system is a proprietary gene optimization technology that can alter both naturally occurring and recombinant gene sequences to achieve the highest possible levels of productivity in any given expression system. The OptimumGene™ algorithm takes into consideration a variety of critical factors involved in different stages of protein expression, such as codon adaptability, mRNA structure, and various cis-elements in transcription and translation. Fruitful results in even the most difficult sequences: GenScript's advanced algorithms optimize highly repeated sequences, extremely long sequences, and sequences with large numbers of parameters for increased protein expression. Comprehensive usage tables for optimization in any host: GenScript boasts an extensive collection of proprietary codon usage tables, allowing you to do codon optimization in any host, any time for either basic research or industrial applications. For example we have specific codon tables for organisms, such as Pichia and Sf9, which are widely used in development procedures. DNA vaccine design: GenScript provides effective solutions for your vaccine needs, such as screening and optimizing parameters involved in regulating vaccinal gene expression and immunogenicity. Customized solutions: The optimization can be tailored to meet your specific needs of even the most esoteric project. Use FREE Rare Codon Analysis Tool to check if your gene needs to be optimized. OptimumGene™ produces over 10,000 candidate sequences during round one alone. A complex sorting matrix then selects for the best sequence for each specific customized request. GenScript has accumulated years of experience in codon optimization and gene synthesis. Our system has optimized over 50,000 gene sequences in almost all major expression systems. Many top pharmaceutical companies are our customers. "I think GenScript provides absolutely excellent products in a timely fashion. I have primarily used genscript to order codon optimized artificial genes. Ordering artificial genes on their website or via Email makes this especially facile because I can simply inquire about a gene, get a quote and then get a PO#. The whole process is fast and the turnaround time for obtaining the finished product is usually less than a month. I also think their technical support are wonderful people, they have been most helpful in facilitating the process. I am so impressed with them that I have recommended them to several of my colleagues." Fig. 1. GenScript OptimumGene™ codon optimization genes increased the yield of expression (8 out of 10 genes) and the degree of solubility in some cases (6 out of 10 genes) compared to the native genes. Significant Increase Drug Target Proteins Expression Level in E.coli. Figures below manifested the effectiveness of the OptimumGene™ technology in increasing drug target proteins expression levels for two different genes expressed in E.coli. Fig. 2. 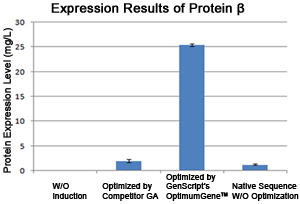 GenScript's OptimumGene™ codon optimization delivered 10 times higher expression level for protein α compared to non-optimized native gene sequence. The expression level was 3 times more than that from Competitor GA's optimization method. Fig. 3. 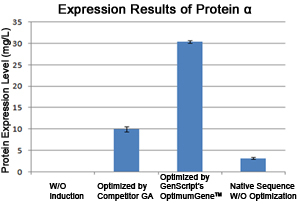 GenScript's OptimumGene™ codon optimization delivered 20 times higher expression level for protein β compared to non-optimized native gene sequence. The expression level was 13 times more than that from Competitor GA's optimization method. Note: GenScript will not claim any rights whatsoever over any intellectual property or technical protocols involved in OptimumGene™ codon optimization and gene synthesis services such as gene sequences or any materials submitted by the customer. GenScript will not release such information to any third party without customer consent. Sensitive information is only disclosed to the personnel responsible for the successful operation of the project on a need-to-know basis. GenScript will sign a non-disclosure or confidentiality agreement to ensure customers' full rights over IP for the optimized and synthesized genes if needed. For batch orders, please send us gene sequences in FASTA format or fill out and upload the Quick Quotation Request Form. Our Ph.D level representatives will help manage your projects from sequence design, optimization, synthesis, cloning and beyond without any additional charges (Certain Terms and Conditions Applies). GenScript customer service personnel will have access to all the information on the form, we will input all the information into our system, GenScript will handle the information according to our confidentiality agreement with client. There is no fee charged by us to design or verify the cloning strategy, sequences and enter them into our system for you. You agree that there will be process time to verify and enter the sequences into system. For regular orders, we will try our best to process within 24 hours. You agree that GenScript can contact you and request or verify any information that is needed to proceed the quote if GenScript thinks the information on the form is inaccurate or incomplete. You will be responsible to provide all information that is needed to process the quote.